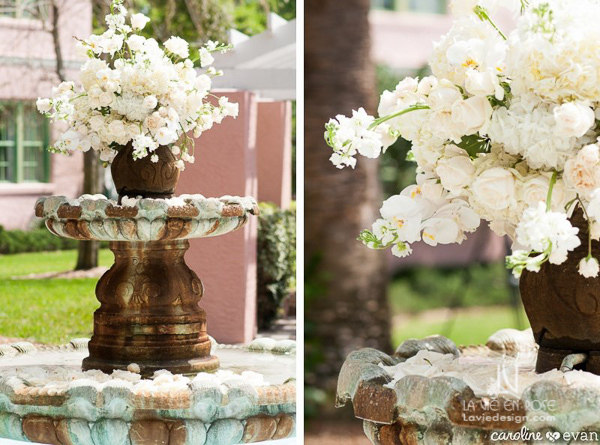 Julie and Brian said their vows while surrounded by hydrangea,peonies, ivory roses and white phalaenopsis orchids, at the Vinoy Renaissance St. Petersburg Resort and Golf Club! 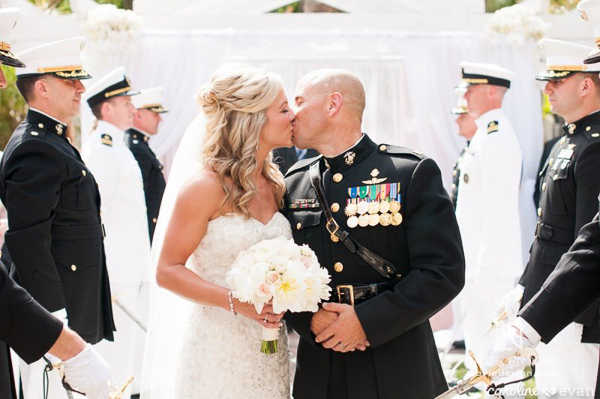 The colors of choice were gold and blush, which both represent everlasting love. 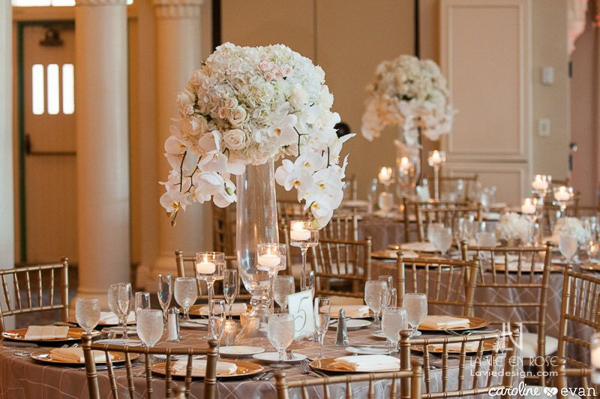 The arrangements of this wedding were meant to create a space of fairytale-like elegance, and we used glass globes strung with orchids and spray rose to help set that mood. 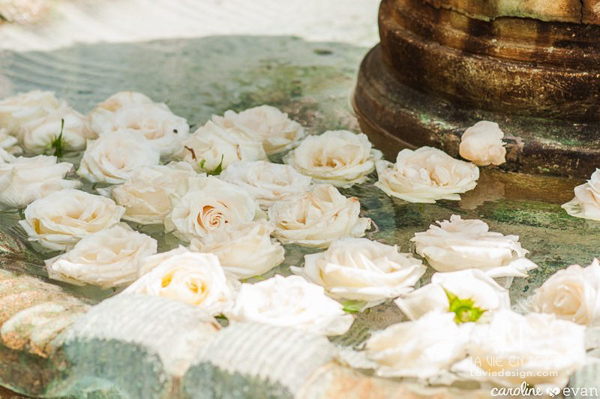 Floating roses in the fountain of the Tea Garden completed the look! 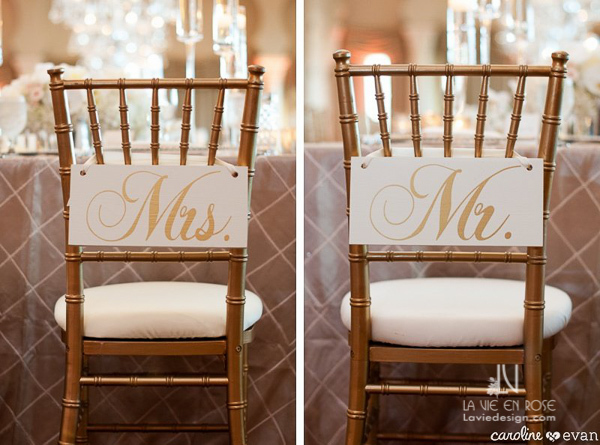 La Vie en Rose provided all florals, chargers, crystal candelabras, candles, drapery, specialty linens, lighting, and lounge furniture. Thank you to Caroline and Evan for capturing the moment! 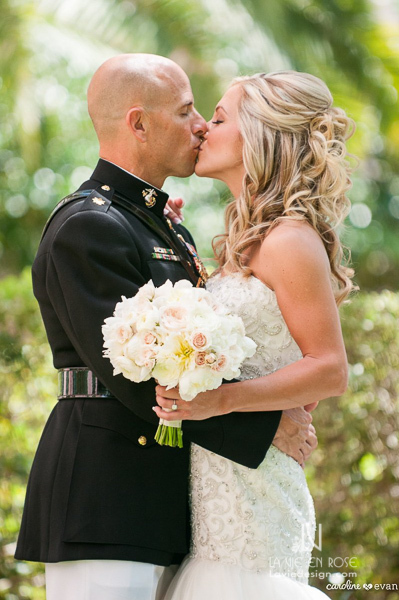 The bride’s bouquet was made up of garden roses, peonies, and blush roses. 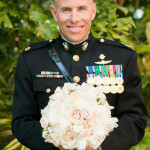 On the left – the flower girl pomander with roses in blush. 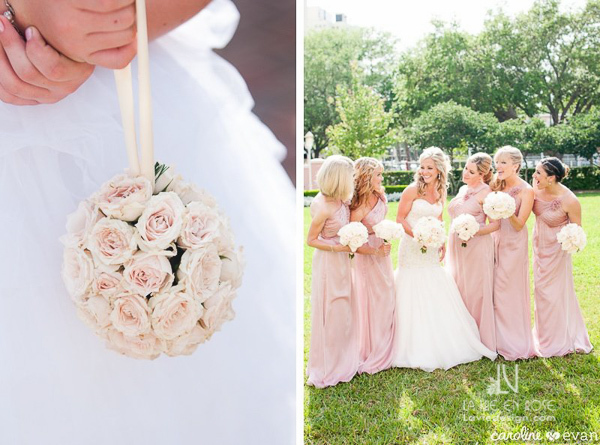 Right- The bridal party is looking fantastic in blush gowns with ivory bouquets! Roses, spray rose, phalaenopsis orchids, stock and hydrangea were arranged for this ceremony centerpiece. 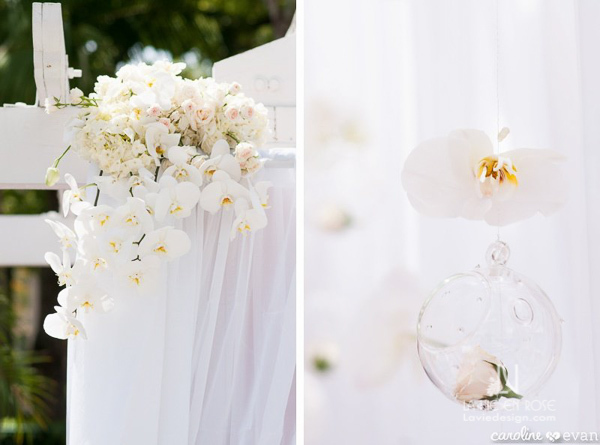 Right- A close-up reveals the delicate glass globes tied with hanging phalaenopsis orchid bloom, and containing a single spray rose bloom. 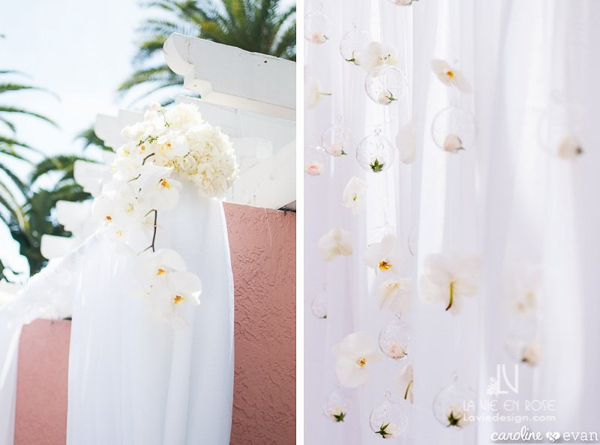 Left- A closer look at the structure draping and ceremony arrangement. Now it’s official! Let the party begin! Our chargers went well against the specialty linen ordered just for this wedding. 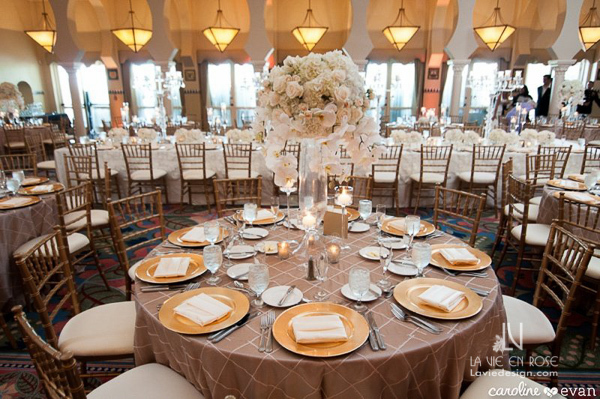 The gold was a great pop of color base underneath our tall centerpiece. All the arrangements throughout the wedding contained the same elements, and allowed the ceremony to flow easily into the reception. 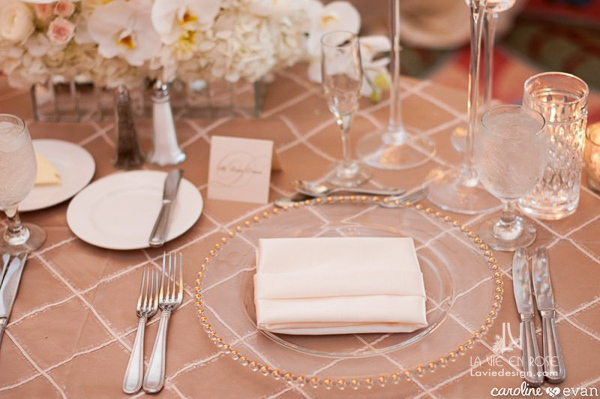 Our glass chargers with gold plating were perfect for this wedding party table! 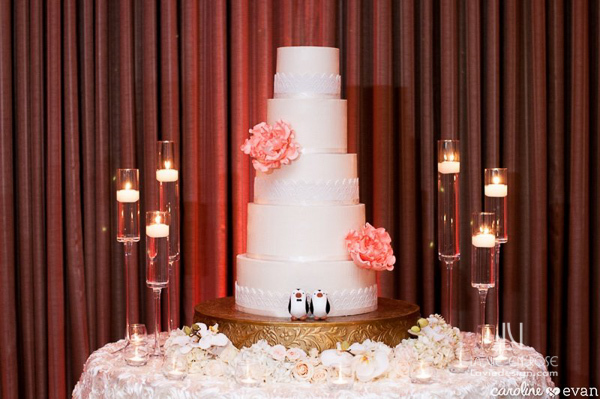 Floating candles were a nice addition to the cake table, and how cute are those penguins! ?